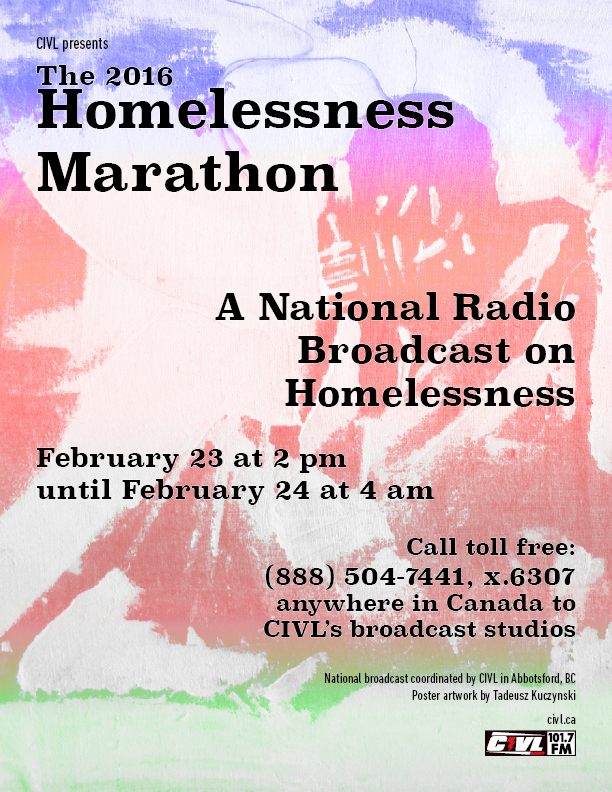 On Tuesday, February 23, Peach City Radio will participate in the 14th annual NCRA Homelessness Radio Marathon. This event broadcasts nationally live from the streets, all night, coast to coast to coast, in an effort to raise awareness of homelessness in Canadian Communities. This year, this 14th annual event will be hosted by CIVL 101.7 FM Abbotsford BC. It will include 30-minute to two-hour segments from 14 stations representing six provinces, as well as a special edition of GroundWire focusing on homelessness, with headlines and feature stories from more stations across the country. Peach City Radio is proud to be able to provide this broadcast to you on our online stream, working together with stations across the country to help find solutions to this national problem. Peach City Radio will provide full coverage of the marathon via a live stream from CIVL in Abbotsford for 14 consecutive hours, beginning at 2pm Tuesday February 23. Tune in to the Peach City Radio online stream by clicking the 'Listen Now' button between 2pm Tuesday February 23 through to 4am Thursday February 24.